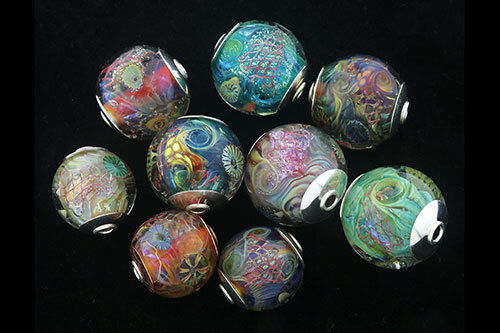 From small beads for jewelry making to large focal ones that make a statement on their own, from sterling silver interchangeable necklaces – that are designed to go perfectly with our beads – to our learning library of ebooks and tutorials for lampworkers, we offer a line of products that are meticulously designed and crafted. Once or twice a year, we offer our glass and jewelry on our Online Bench Sale – a virtual trunk show. If you are interested in being notified for our next Bench Sale, please sign up to receive our eNews here. Our current series – Enchantment, Scheherazade, Celestial, Ornate, and Dragon Scale are available for purchase via private arrangement only at this time. If you are interested, please contact us via email. These series are cored in sterling silver and capped in either sterling silver, copper, brass, or a combination of two of the metals. The smallest ones are approximately 25mm/1" from hole to hole and the largest ones approximately 42mm/1-5/8". Photographs below are sample of beads in each Series and do not indicate what's currently available for sale. Our Enchantment Series beads/pendants range from $125 to $175. 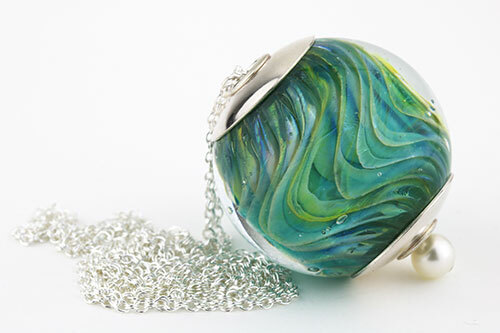 Our Enchantment Mini Globe Series beads/pendants range from $55 to $75. 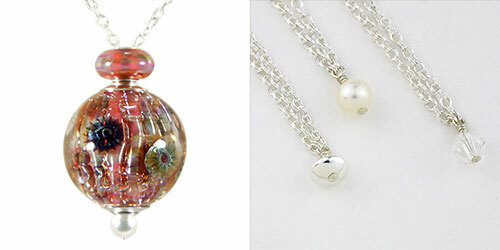 Our Scheherazade Series beads/pendants range from $165 to $225. 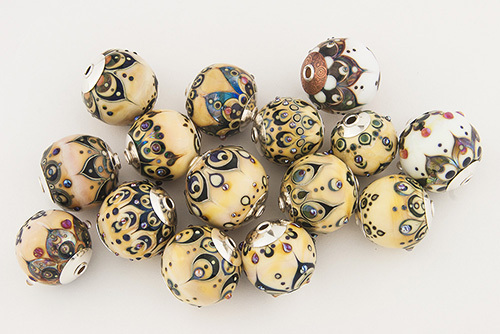 We also offer smaller Scheherazade beads from $55-$125, please inquire. 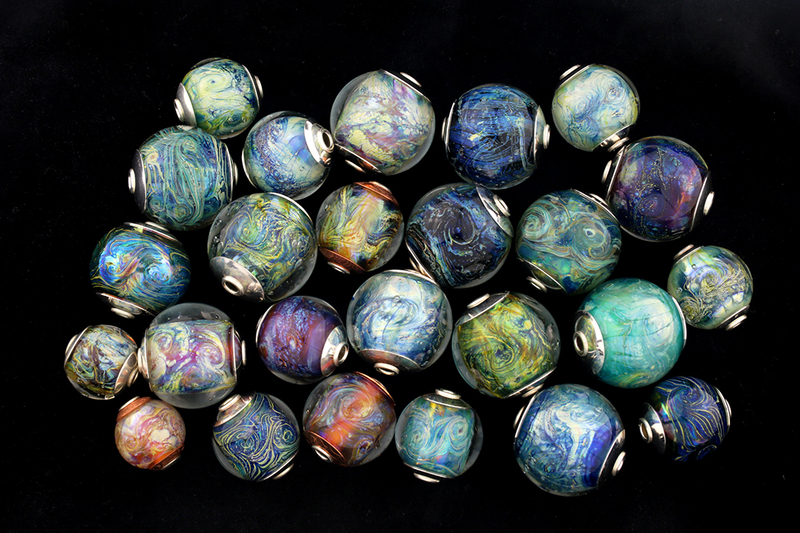 Our Celestial Series beads/pendants range from $95 to $195. We also offer smaller Celestial beads, please inquire. 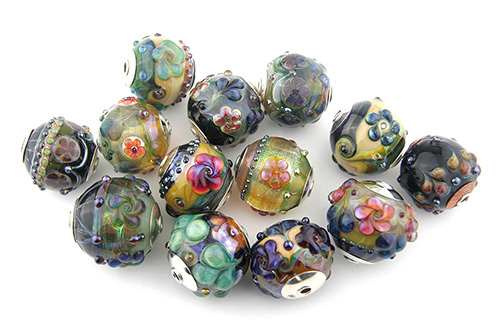 Our Ornate Series beads/pendants range from $85 to $225. 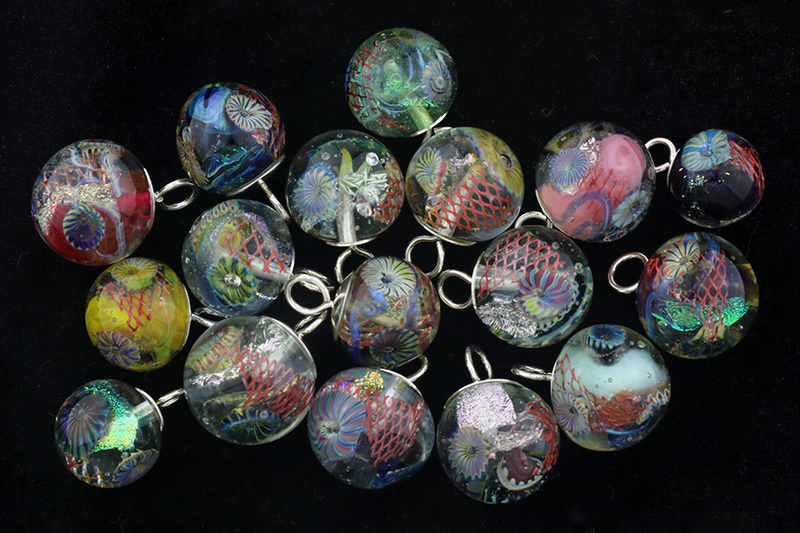 Our Dragon Scale Series beads/pendants range from $95 to $225. 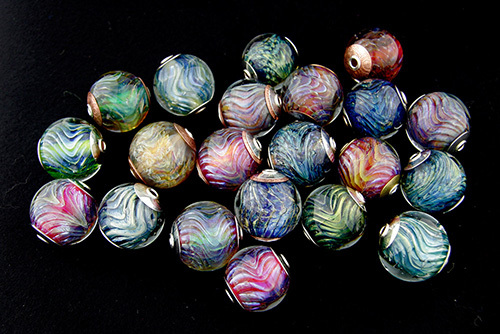 We do offer smaller Dragon Scale beads, please inquire. Interchangeable chains are available for purchase here. We offer one step-by-step tutorial, Swirl, one reference ebook, Bedazzled, and 11 compilation ebooks. For more information, visit our ebook and tutorial page. We are excited to have our jewelry pieces featured at The Melting Point, a glass gallery and studio in Sedona, Arizona. For more information, visit our galleries page. These is nothing better than seeing our work in person, visit us at one of our shows or arrange to stop by a venue Hayley teaches, check our schedule for details! Hayley has ventured into designing lace shawls and we are delighted to offer our knitting patterns, Serendipity, Affinity, Meandering, Quadratische Decke Shawl, Pfingstrose (Peony) Shawl, Blattkranz Shawl, and Diana. For more information, visit our knit page. In addition to our ebooks and tutorials for purchase, we offer a lot of good information including free tutorials on the Silver Glass 101 section of our site.